This roast squash and chickpea salad with tahini dressing is becoming a favourite winter lunch around ours. It’s lovely served with the squash still warm from the oven, and keeps well in the fridge. I bring it back to room temperature before serving, and freshen up the seasoning. The original recipe is from the Casa Moro cookbook. If I had to pick a favourite restaurant, Moro just might be it. I celebrated my birthday at Moro in the late 1990s (when we were both fresh faces on the London scene). Pared-back, unfussy food; authentic sourdough bread baked in a wood-fired oven; a casual, battered aesthetic – it was exciting and new back then. When we were settling up, someone mentioned that it was my birthday. The waiter returned with our receipt and an enormous loaf of sourdough – it was easily the diameter of a large pizza. A much-appreciated gift, as decent bread was a scarce commodity in London back then. Toss together the squash, garlic, allspice and olive oil. Spread in a roasting tray and season with salt and pepper. Roast for about 20 minutes, or until soft. Set aside to cool a bit. In a small bowl, whisk together the garlic, salt, lemon juice, tahini, and olive oil. Thin with water until the dressing has a pourable consistency. Adjust the seasoning. 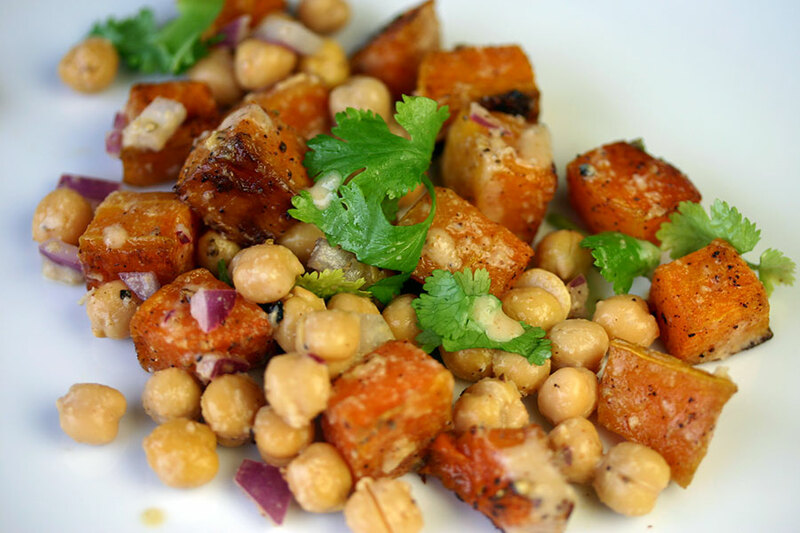 Combine the squash, chickpeas and red onion, then toss with the dressing. Garnish with the coriander leaves and an extra drizzle of olive oil.